Tutankhamun The Eternal Splendor of the Boy Pharaoh "Soft Cover"
On 27 November 1922, British Egyptologist Howard Carter peered into the tomb of Tutankhamun, the first to lay eyes on its interior in over 3,000 years. As his eyes grew accustomed to the light, and statues, furniture, and gold came into view, it was all he could do to answer Lord Carnarvon’s question ‘‘Can you see anything?’’ with the words ‘‘Yes, wonderful things.’’ Even superlatives such as this can scarcely do justice to the overwhelming riches that were to be discovered, which for many are beyond words. 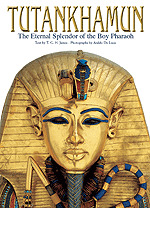 Personal funerary equipment and ritual objects, ritual furniture, figures of anthropomorphic and animal deities, dress and cosmetic objects, breathtaking jewelry, and of course the famous golden mask of Tutankhamun, were found packed into the young king’s tiny tomb. The discovery was instantly hailed around the world as truly remarkable, not only because of the tomb’s fabulous treasures, but also because the coffin and burial were almost intact since the time of Tutankhamun’s death in about 1336 B.C. Now a large selection of the tomb’s contents are presented here for close examination in a series of stunning color photographs that reveal the astounding beauty and craftsmanship of ancient Egyptian art. They are accompanied by black-and-white photographs of the excavations and excavators, and fascinating texts on the historical background of Tutankhamun, the discovery of the tomb, and the treasures themselves.